The basic concept is to offer the user a kind of GUI where he/she can enter or select the required information and then triggering a runbook without the need of any SCOM permission. First lets start with the easy part . We need the SCOJobRunner tool. You can download it from CodePlex where you also get the syntax how to use it. This tool is just one SCOJobRunner.exe file which you can use to start runbook jobs using a script or some other tool. Below is a screenshot of the GUI I designed in Powershell. I used the free “PrimalForms Community Edition” editor to create this interface. Behind each control I wrote the parameters in red color which we use later in the “Initialize Data” runbook activity. Comment => If you don’t add a comment the current user login name will be put into the comment field. 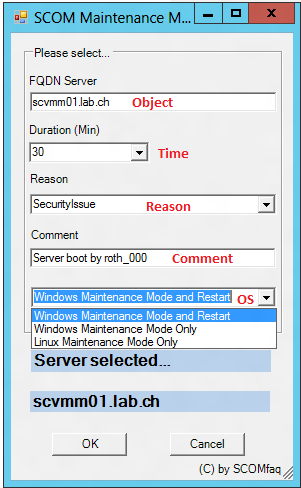 Now you can choose either only put the Windows or Linux server into MM or put the Windows server into MM and restart. Remember, each of these parameters are submitted to the runbook and can be used as published data! $Webserver => Server which hosts the Orchestrator web service. Download my example (Start-RemoteMaintenaceMode.ps1) here. There are 4 runbooks, “1.1.0 Main”, “1.1.1 SubLinux”,“1.1.2 SubWindows” and “1.1.1 SubWindowsRestart”. 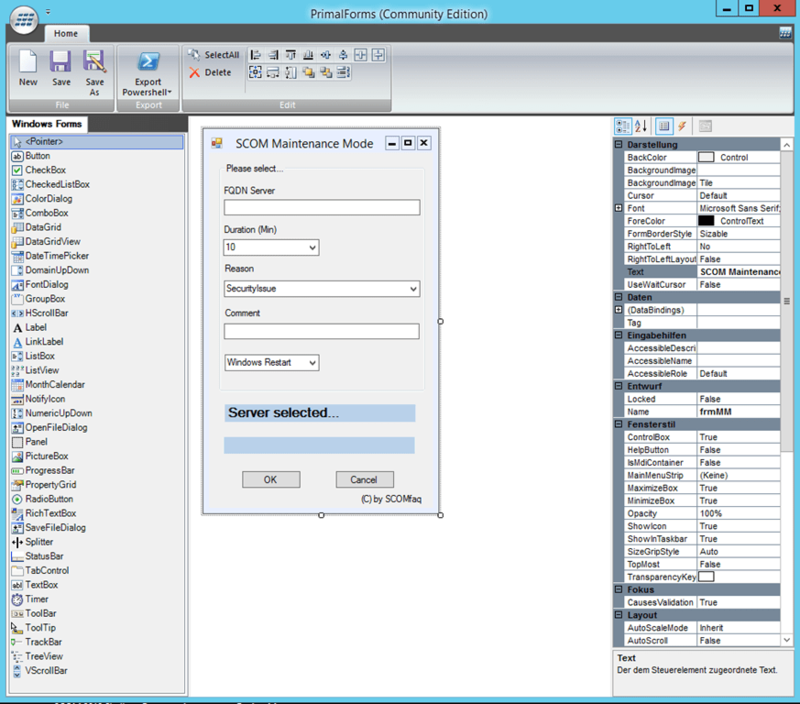 The “1.1.0 Main” runbook uses the “Invoke runbook” activities to call the corresponding child runbooks and depending on the result of the child runbook it generates a critical or information alert in SCOM. Below I documented one of the three workflows. You can easily adapt the other two workflows. The “1.1.1 SubLinux” is configured get the data from the “1.1.1 SubLinux Invoke Runbook” and submits the parameters to the maintenance mode activity. 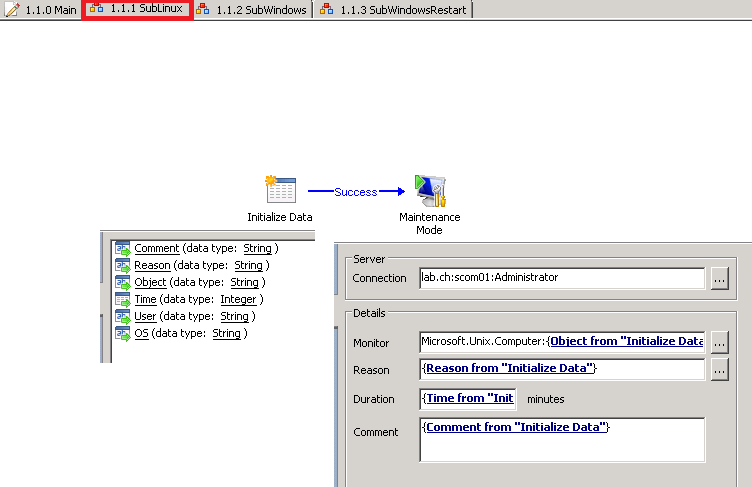 The “1.1.2 SubWindows” is configured get the data from the “1.1.2 SubWindows Invoke runbook” and submits the parameters to the maintenance mode activity. 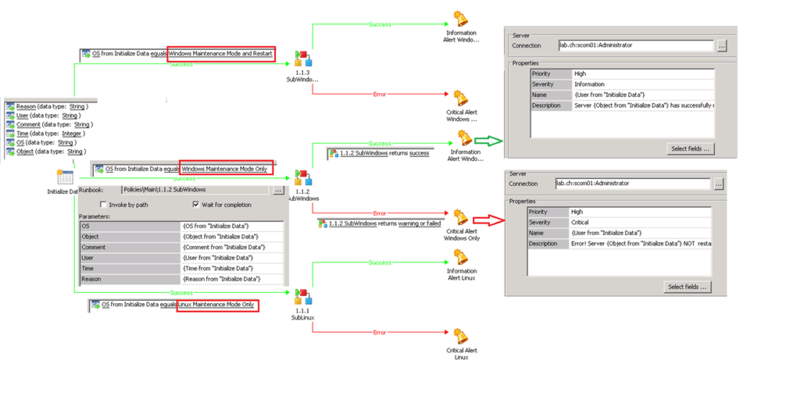 The difference to the “1.1.1 SubLinux” runbook is the class you need to configure on the maintenance mode activity. Instead of “Microsoft.Unix.Computer” you need to set the “Microsoft.Windows.Computer” class. The last runbook “1.1.3 SubWindowsRestart” gets also the data from its parent runbook and it is set up the same way as “1.1.2 SubWindows” runbook the only difference is that I added the “Restart System” activity to restart the system. At this point you have to be aware of a few things. Because the Orchestrator service account executes all the runbooks this accounts needs permission in SCOM to put servers into maintenance mode and also permission to restart all the systems. In my tests I added the service account to the domain administrators group. If you receive an error “The requested operations requires Publish permissions on the Runbook” read this here . If you want to set minimal permission for a user on a runbook read this here. If you configured everything right you should be able to run the Powershell GUI and start the runbooks. My goal is not to provide a final solution which you just can download and install. My intension is to show a possible way/solution which you can easily adapt and extend. I think it is a cool solution/idea which helps you to overcome certain difficulties and get a kick-start . Nice – I will look into that..